A window is a precipice between public and private space; it is a moment when a wall becomes permeable and one is permitted to look in on another's interiority. The home is an accumulation of private spaces, starting at the living room ending in the bedroom. However, the private spaces I’m most interested in are the ones inside ourselves, which we experience in solitude. There is a similarity between the physical partisan walls of a house and the psychological boundaries we set up within ourselves. A window is both a barrier to the public and an invitation to the private. Observation is an exercise of patience and concentration, which requires a willingness to be surprised. It is about looking without assuming and listening without interrupting. A painting can slow this experience of looking and is a way to translate time through observation. It is an invitation to linger and an offering of shared momentary solitude, which rewards awareness and self-perception. 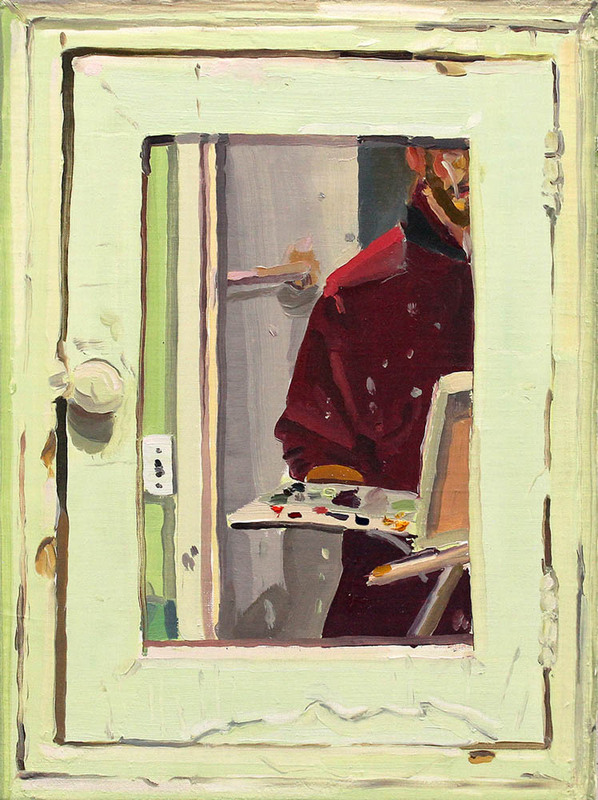 To practice observation through painting is to resist an urge to generalize. It is to see something (or someone) as an individual. Hi Keiran! Thank you so much for talking with us. Can you tell us a little bit about your background and what drew you to both painting and creating in general? I grew up in Toronto and went to an alternative elementary school where students were encouraged to form their own way of learning, without grades, homework or standardized tests. The school focused on the tactile and tangible and always valued making. I then went to an arts high school called Etobicoke School of the Arts, which transformed the way I understood the potential of painting to be a vehicle of communication and personal exchange. Do you remember some of the first instances in which you felt a need to physically make something with your hands? For a project in 4th grade a teacher brought in a roll of light sensitive paper and had us lay on it under the sun. We then covered it with a blanket and ran it inside. What was left over was the shadows where we had lay. I remember seeing my body exist through reproduction in the world outside myself, which felt peculiar and profound. After that I began pushing paint around and drawing, trying to understand and reproduce that feeling of surprise. In this series, what drew you to windows, which we see through, and mirrors, which reflect back to us? What’s your perspective on the relationship of the two, and generally the figures of the mirror and the window in general? I’m interested in the way a window becomes a permeable wall of a building. Walking outside at night, seeing someone in a window across the street is a framed moment of intimacy with a stranger. Paintings are also often framed moments of exchanged and looking. But more then that, I love that the window is something that you look out of, past its frame and into the distance, while its glass reflects your interior. Making the paintings head on, turns them into pieces of architecture when they hang in the world. The viewer stands in the same place as all the people who have looked out that window. It’s a sense of embodiment and grounding, occupying the space someone else previously stood. The figures in the mirrors or windows are based on my reflection while making the paintings, but the face is rarely shown. I liked the idea of sharing space with someone across distance and time, so the reflection could be yours as you stand in front of the painting. I’m drawn to paintings that acknowledges and encourage your looking, the perspective is often first person, aligned with your feet on the ground. Whose windows are you painting? This series was based on a small cabin community I grew up in outside of Toronto. The interior of the cabin hasn't changed in the 16 years I’ve been going there, it feels like a container of time. During the day I would make a painting outside, looking into the windows and at night I would make a painting from the inside looking out. It was a mapping of the space and a meditation on memory. While I was painting the window with the gold curtain a golf ball game through the window, which is where the broken glass and hole come from. So, to get back to your questions, they’re windows I’ve always looking out of but never at. You said that “The home is an accumulation of private spaces, starting at the living room ending in the bedroom.” Can you talk a little bit more about this? Do you find that this is true of your own home, and that it is a reflection of who you are in private? You also said that “the private spaces I’m most interested in are the ones inside ourselves, which we experience in solitude. There is a similarity between the physical partisan walls of a house and the psychological boundaries we set up within ourselves.” I found this fascinating, particularly the relationship between the physical walls and psychological boundaries. What led you to this conclusion and how do you explore it in your work? Sure! I’ve been really into Bachelard's Poetics of Space and how he unpacks the psychology of the different rooms of a house. In grad school I was able to take a few architectural theory courses and I started looking at the post-war nuclear family homes and how the behavior of a family is implied in the architecture. These homes usually start with the living room, the most public space and weave their way backwards to the bedroom. The progressive narrowing of space indicates the amount of potential occupants, transitioning from the crowd to the individual or couple. The patrician walls of a home create privacy as well as produced boundaries. I’ve always been most comfortable in smaller space, where the world feels tangible. The recent paintings are about letting someone into this privacy and quietness, to experience solitude together. What is your relationship to observation, and do you find it to be an easy or difficult practice? To what benefit does the medium of painting serve in this series, or in your work in general? What does painting do for this topic that another medium might not be able to? Observation is an exercise of patience and concentration, which requires a willingness to be surprised. It is about looking without assuming and listening without interrupting. A painting can slow this experience of looking and is a way to translate time through observation. It is an invitation to linger and an offering of shared momentary solitude, which rewards awareness and self-perception. To practice observation is to resist an urge to generalize. It is to see something (or someone) as an individual. You used the word ‘solitary’ a few times, and I was hoping you could talk about what your relationship is to being solitary, to solitude? How do you decide on a color palette for a painting? Do you paint primarily from an aesthetic point or a mood point, when it comes to color? I love the green tile, the pink frame, the yellow curtain. When painting from observation I don’t determine the color palette before hand, but try and be receptive to the thing that I am painting. I use a fairly limed palette of 6 colors; a cool red (quinacridone magenta), warm red (cad red light), warm blue (ultramarine), cold blue (phthalo blue), warm yellow (cad yellow deep) and cold yellow (cad yellow light). Using temperature as the main variable the limited palette forces me to mix every color precisely as I see it, at that time of day under those lighting conditions. I want there to feel like there is air in the paintings even if there’s no depicted space, so you can feel the atmosphere between you and what you’re looking at. The furniture and materials in the cabin, where these paintings are based, is primarily from a 1950s Sears catalogue, which is where the green tiles, wood paneling and linoleum counters come from. Your paintings seem—in a sense—quiet. Would you agree? Yes! Absolutely, I hope for them to be a prolonged moment of quietness. I think observation can also be applied to listening. Can you talk about the use of focus in your work, in other words, that these are entirely in focus? What purpose does that serve, and what is the relationship between clarity and observation? I’m really glad you noticed that! I was thinking about the focus in relationship to observation and the time it takes to sit in front of something and paint. When a camera captures an instant it has to decide what to focus on, but when painting from life your eyes can move around and focus on each aspect individually, which I think creates a disorienting clarity that we’re not used to seeing. So in a way the overall sharp focus is about the time it takes to make a piece. For a long time I was making figurative work from photographs. They would always be set in non disrupt places and the figures would allude to some myth or allegory. I felt like I was continually justifying who the figures were and what they were doing, which got in the way of looking. I remember making a painting in undergrad where I removed the figures and left the open space. It felt so much more accessible, like a stage or set you could project into. It feels like surfaces are hugely important here, not only in that they provide spaces for our objects but in an of themselves. Would you agree? For example, the towel rack almost takes on a life of its own in the green bathroom. Yes! I want the paintings to feel like you could intuitively understand the texture of the surface they refer to. I believe our senses are much more intertwined then how we normally talk about them and I believe it’s possible to feel the texture of old wood vs. the coldness of a porcelain tile just through looking. That is why I like to think about color in terms of temperature, it has such a close link to touch. I remember seeing an Ingres painting in the Met, in one of the back rooms of the Robert Lehman collection with the magenta velvet walls. In the painting a woman is wearing a think blue satin and lace ballgown and you can feel the fold of it and imagine exactly the texture of the fabric on your skin. Are there any reoccurring themes that you keep coming back to? Any color palettes or moods? On the other hand, are there any concepts that you’re excited to explore and haven’t yet? Domestic interiority has been a consistent aspect in a lot of my work. I used to paint with a very low value contrast palette, so the painting would emerge to your eyes slowly, but since painting from observation the paintings have felt sharper and more saturated. I just spend a summer in Boise Idaho at a residency at the James Castle House and there was a completely different type of light there, which seeped into the paintings I made. It’s a very dry heat with no moisture in the air, so the light feels sharper and piercing, but at certain times of day the reds and pinks glow more vibrant then I’ve ever before witnessed. The residency is on the property where James Castle lived for fifty years. Castle was a self taught artist who was born deaf and never learned verbal language but made thousands of drawings of his surroundings and imagination throughout his life. I spent a lot of time painting in the shed where he slept and worked. Still standing the space reveals its history in peeling wallpaper and empty cabinets. This space was an adapted domestic interior with a presence of someone else past. It was a rich and dense place to make work which has made me rethink and want to explore other spaces with similar histories. What’s a typical day like for you? Are you a person of routine, and if so, what is it? I’m fairly routined but not in a regimented way. I like to bike in the morning, usually I do a loop form my place on 136th street around central park and back, then make something to eat and am into the studio around noon. I listen to a lot of podcasts in studio and take care of emails and the administrative side of things, then I tend to do most of my painting in the evening and into the night. This routine changes when I’m on site somewhere else painting. In those situations I usually try and get one small painting done during the day, take a break and make another small painting in the evening when the light is stable and the sun has gone down. Do you look to other artists for inspiration? Or do you find that your creative process is renewed by looking outside of the art world? Or both? Who are some artists that have influenced your work, or even inspired you to turn in a new direction? I look at a lot of other artists for inspiration, both living and dead. I love visiting museums and seeing paintings in person and last summer I got to see the Caravaggio paintings in Rome, which was life changing. I also deeply admire Edward Hopper, Fairfield Porter, Edouard Vuillard, Pierre Bonnard, Ad Reinhardt, James Castle, Julio Larraz, Catharine Murphy, Kerry James Marshall, Robert Gober, Josephine Halvorson, Lois Dodd, Eleanor Ray, Doron Langberg, Jennifer Packer. This summer I was reading a lot of color books: Goethe’s Theory of Color, David Batchelor’s Chromophobia, Maggie Nelson Bluets and The Argonauts, Adam Alter’s Drunk Tank Pink. I also like fiction a lot; Philip Roth, Richard Yates, Raymond Carver etc. In the studio I listen to a lot of podcasts like; The Daily, It’s Been a Minute, Now What with Arian Foster, RadioLab, This American Life, Rough Translation, Still Processing, Ezra Klein, The Wilderness, More Perfect, Longform etc. etc. etc. I have a guilty pleasure of watching football. I used to play sports and was a wide receiver in high school until I tore my ACL and MCL, which put an end to that. But I still think there are certain aspects about the game that are deceptively beautiful. Each play is choreographed, with timing and speed 11 people have to be doing individual tasks simultaneously for the play to work out. I like that it’s a contained amount of action happening on a rectangular surface… similar to painting? Can you tell us a little bit about your studio space, and how you like to get work done? What are some of the things that are important to you in your day to day process of being in the studio—for example, can you work among chaos or do you need to have everything in its place? I try and keep my studio fairly clean and organized, but it can get a little out of hand. I end up collecting too many books or supplies and get overwhelmed and have to do a big clean every few weeks. I don’t like to work if things feel out of place, the spatial clarity keeps me grounded. So before starting a new painting I usually have to get the space feeling good. Night air through my open window and a view of the city lighting up as the sun sets. Is there any advice anyone ever gave you that really resonated with you? To lean into doubt with courage and use it as a compass that points you towards what you’re most uncomfortable with. I’m going to Toronto in mid September for a final round of a Canadian painting competition, then in October i’m going to be an artists in residence at the The Macedonia Institute in Chatham NY, then a group show in Toronto in November and possibly the LA art fair with 1969 Gallery in late January. To find out more about Keiran and his work, check out his website.